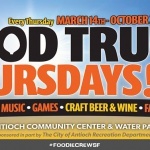 The Foodie Crew and the City of Antioch Recreation Department are thrilled to announce that Food Truck Thursdays is back again for the third year in Antioch. Our official kick off date will be Thursday, March 14th and we anticipate another fun and exciting season, bringing you 8-10 gourmet food and dessert trucks every Thursday from 5:00-9:00 p.m. until October 31st (except for July 4th). In addition to the array of trucks, we also will have The Guzzler Beer & Wine Truck keeping you refreshed with an assortment of craft beers and wines and entertained sports on their Big Screen TV’s. 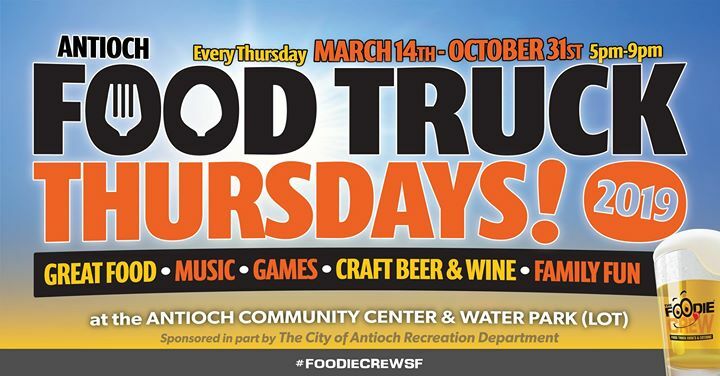 Food Truck Thursdays will once again take place at the Antioch Community Center and Water Park parking lot located at: 4703 Lone Tree Way Antioch, CA 94531. Food Truck Thursdays is a kid, family, and pet friendly community event with FREE admission. In addition to all of the delicious food and beverages; we will also have giant family friendly games, face painting on certain days and music…with occasional live music performances and DJ’s.